A great interactive book for toddlers who are just starting to read. 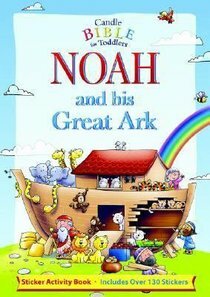 With lots of colorful pictures and reusable stickers to fill in the gaps between the words, "Noah and His Great Ark" is a great way for children to learn. Includes a large picture with more stickers of animals, people, and other interesting items. - Publisher With lots of colorful pictures and more than 130 reusable stickers to fill in the gaps between words, these interactive books retell the stories of Noah and the very first Christmas for the youngest of readers. Full color. Consumable. About "Noah and His Great Ark Sticker Activity Book (Candle Bible For Toddlers Series)"
With lots of colorful pictures and more than 130 reusable stickers to fill in the gaps between words, these interactive books retell the stories of Noah and the very first Christmas for the youngest of readers. Full color. Consumable. Here is a delightful first Christmas book that retells the Nativity story with simple, direct charm. The language and cute, bold illustrations are perfectly suited to the very young. The CANDLE BIBLE FOR TODDLERS is an ideal introduction to the popular and timeless stories from the Bible. Stories from the Old and New Testaments spring to life with exciting, vibrant illustrations and clear, simple sentences, endearing this delightful book to parents and children alike.